Gordon Lappin was signed from Greenock Juniors in the summer of 2005 at the age of 24. A skillful midfielder with an eye for goal, Gordon quickly established himself as the club captain. He made 108 appearances for the club with 99 of those in the starting line up. His greatest moment of being a Bankie was leading the club to promotion to the Super League. His goal against Lanark United being the clincher on a miserable wet night at Glenhead Park. 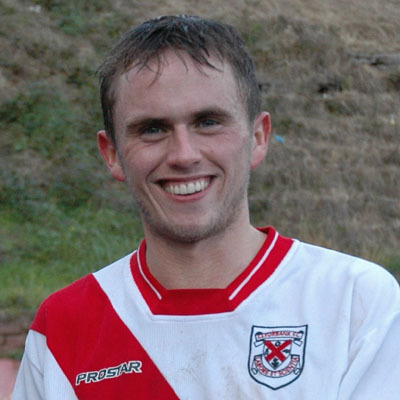 After three seasons with the club Gordon moved on to Largs Thistle where he spent the next 6 seasons. Gordon was born on this date in Greenock. From the sublime to the ridiculous is how the saying goes. And that is the story of the past week. four superb victories in a row were wiped away as the Bankies went down to a humiliating home defeat against Johnstone Burgh who had failed to win in any of their previous 24 matches or score more than one goal in any of these games.